Symphony Ventures is a consulting, implementation, and managed services firm helping enterprises leverage “Future of Work” technologies like Robotic Process Automation and Intelligent Automation to improve their digital operations. By spring 2017, Symphony Ventures was growing quickly. At the time, the still-young company had a logo and a handful of visual elements, but because it was so focused on growth, the leadership team hadn’t found the time to ensure the overall brand reflected the quality of the company’s services. 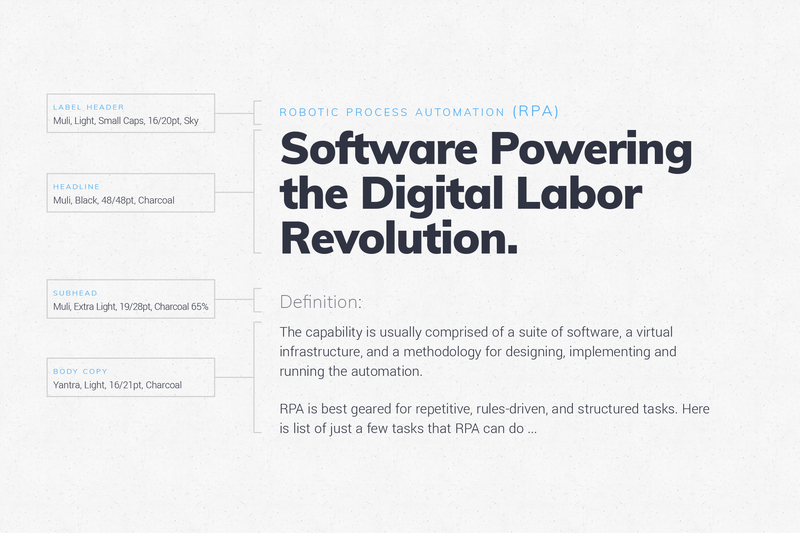 Without a visual identity that aligned with Symphony’s quality offerings, it would be hard to compete in a growing RPA/Intelligent Automation market alongside major consultancies like Accenture. 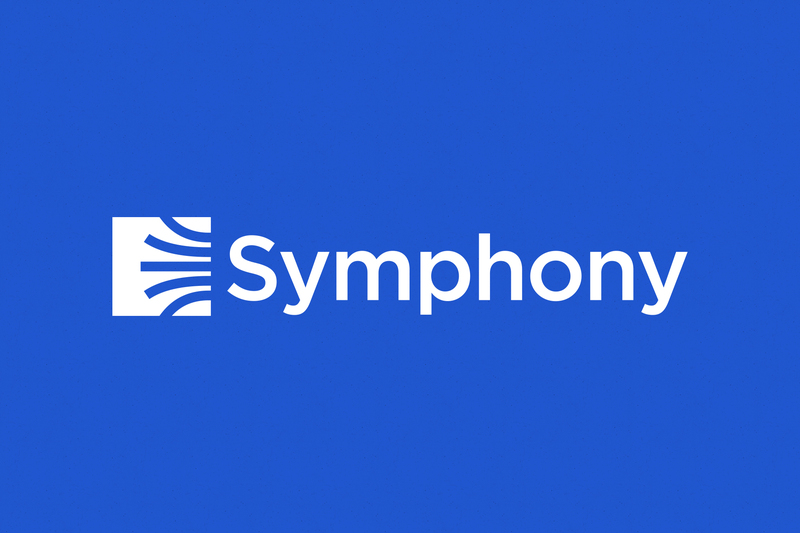 Symphony already had world-class expertise in all things digital operations - it just needed a brand that would truly convey it in an increasingly crowded market. Symphony engaged with Ideometry to consult with its marketing and executive team to make the overall brand more reflective of the company’s trajectory. We worked closely with the leadership team to improve the existing branding while maintaining the brand equity the company had already built. 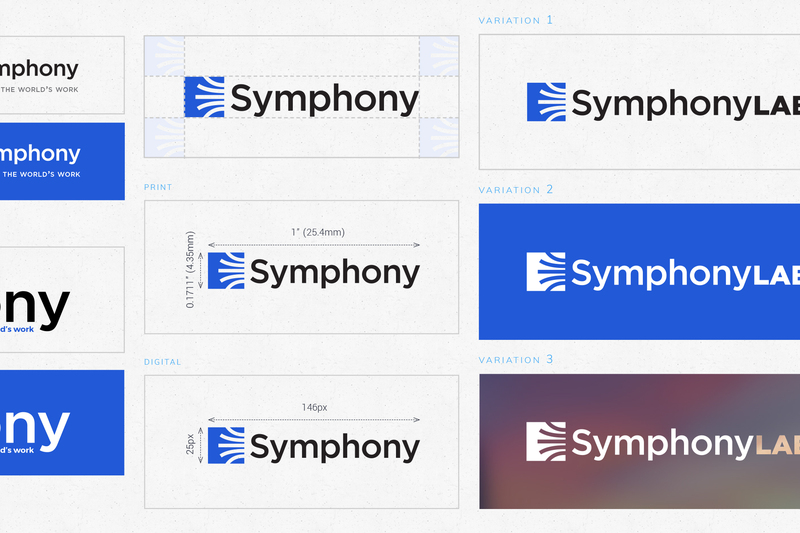 It was more a matter of refining the identity of the company to help it stand up against the larger competitors in the space With the logo done, we began working closely with the marketing and senior leadership team to create Symphony’s overall visual identity and editorial guidelines, which would be codified in a brand guidebook. As Symphony grew, more and more internal and external stakeholders would be creating and publishing branded materials in various places.  Such a document would provide the framework for building a consistent brand across all touchpoints, regardless of the medium or audience. Consistency in branding is important for establishing any company’s positioning by ensuring that the key messaging points and visual identity are presented with clarity and regularity in all externally facing material. 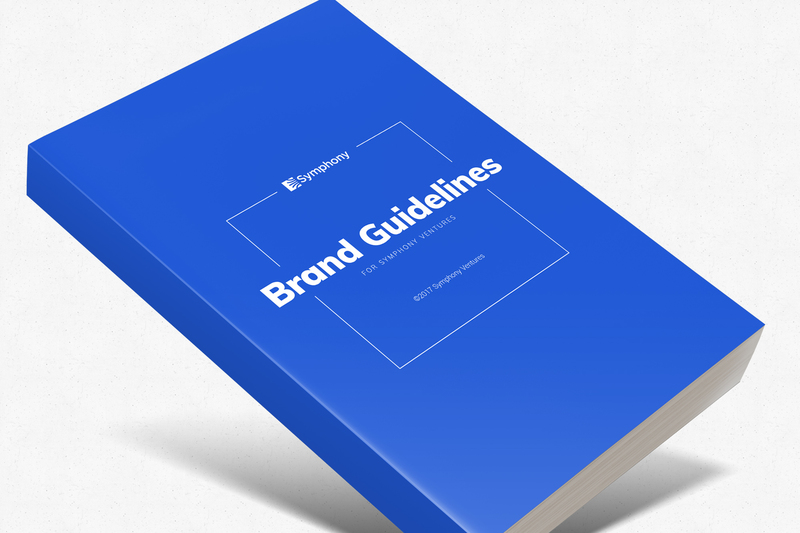 Thus, the guide would be an invaluable tool for anyone who is creating or assisting in the creation of branded Symphony collateral. In terms of visual identity, we created consistent guidelines for proper use of the logo, including several different lockups, clearspace and sizing requirements, and a process for introducing sub-brands using the logo. 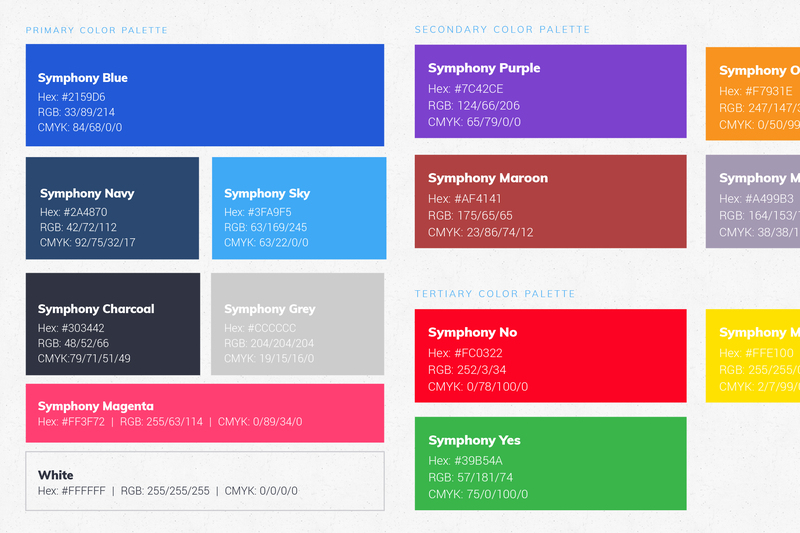 We also developed an attractive color palette, an accepted photography style, lines and fields for supporting graphics, digital CTAs for web pages and emails, a complete typographic system that includes ratios, grids, and fonts, and calls-to-action. 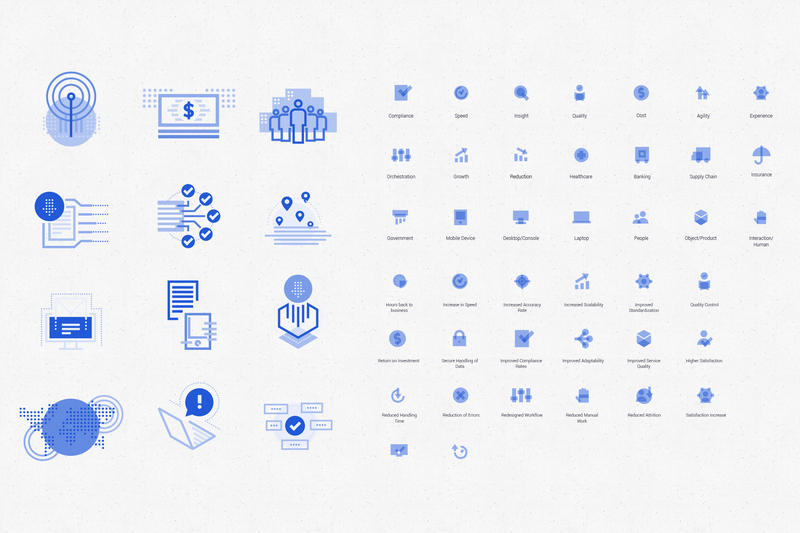 We built a custom library of icons that would be simple and flexible enough for internal teams to develop new custom visuals using the icons. As part of this new iconography, we coded a special collection of project classifiers in the form of icons and illustrations that could be used to visually describe the type of projects/processes that Symphony worked on and would also make it easy to show how their work improved client workflows From there, we established in-depth editorial guidelines. These editorial requirements established everything from the key messaging points, the desired tone and voice for all written material, the proper presentation of the company name in text, localization standards for U.S. and U.K. English, and overall writing style guidelines.  The editorial guidelines included detailed examples to ensure that anyone creating externally facing written collateral knows exactly how to apply the style rules to their own writing. 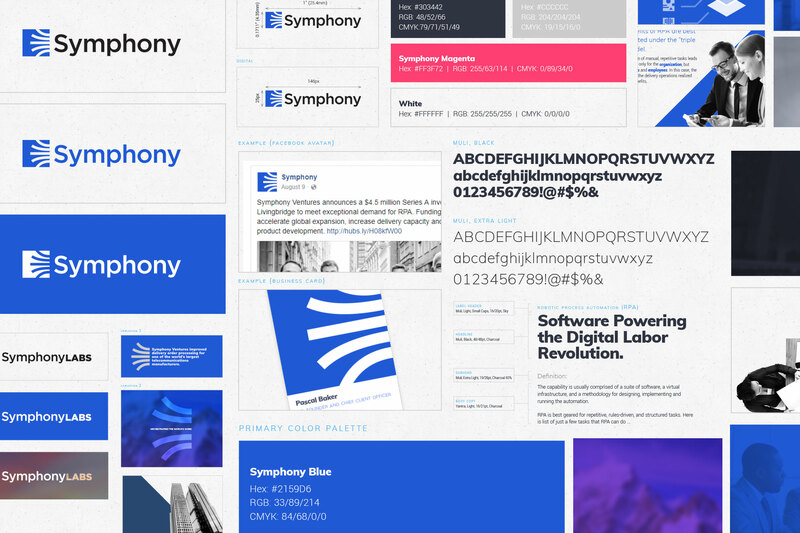 With the brand guidelines approved and published, we worked with the Symphony team to extend the brand to a light refresh on the company website before pushing it forward to an entirely new website build. 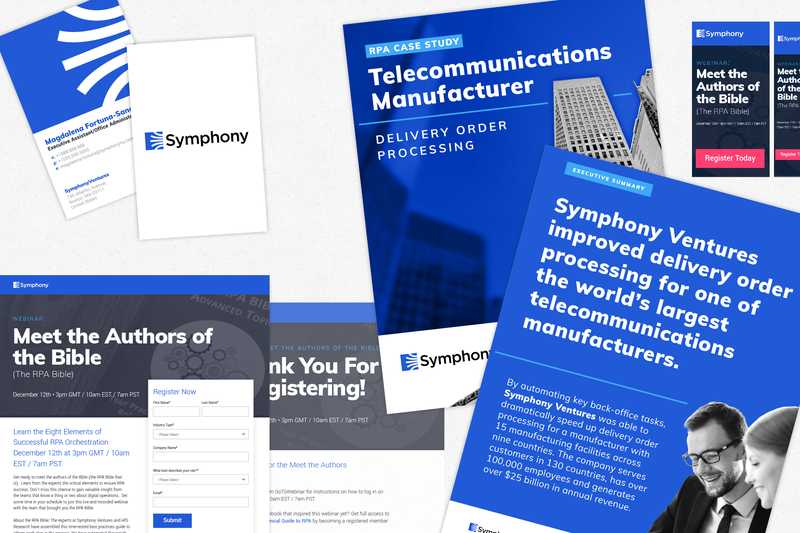 As of early 2018, Symphony had extended the new brand to almost all of its collateral - case studies, business cards, landing pages, email templates, and more.